One of the most forward thinking and innovative performance groups in the 1970s was Labelle. Labelle consisted of Patti Labelle, Nona Hendryx and Sarah Dash. Eventually each went on to establish solo careers. This writer had the opportunity to chat with Sarah Dash about her past and what she is doing currently. Sarah has performed with such greats as The Rolling Stones, The O’Jays, Laura Nyro, Alice Cooper, The Marshall Tucker Band, Wilson Pickett, Bo Diddley and Keith Richards, et al. She has appeared on shows and worked with hundreds of renowned recording artists from Lenny Kravitz to Stevie Wonder. Currently, Dash is doing an upcoming Tribute Show to Aretha Franklin. Ms Dash will be performing 3 concerts in tribute to Aretha on Saturday, November 3 at 8:30 pm at the Union Firehouse, located at 18 Washington Street, Mount Holly, NJ. For ticket information call 609-288-6491. On Monday, Nov. 5th an 8pm performance at City Winery Washington DC, located at 1350 Okie St, NE in DC. For tickets to that performance call 202-250-2531 and lastly on Tuesday, November 6th she is appearing at the Loft, City Winery NYC, located at 155 Varick St in NYC at 8pm. Call 212-608-0555 for tickets. “Initially Nona and I were part of a group called the “Del Capris” and Patti and Cindy Birdsong were in a group called the Ordettes. But both groups shared the same management. As singers came and went, management eventually put Patti, Cindy, Nona and I together and we became “The Bluebelles” and then later “Patti Labelle and the Bluebelles.” Although we sang R&B songs we also did classic songs like “I Sold My Heart To The Junkman, “Danny Boy” and “Never Walk Alone.” This attracted audiences and back in the 70s we became the sweethearts of the Apollo Theater. Our songs and flamboyant dress style became so popular that even though we came on first as the opening act, the audiences would not let us leave. They screamed for us to come back on stage which cut into the performance time of the main acts who were not very happy with us,” recalled Dash. The group recorded with Cameo Parkway Records, then went to Atlantic in 1964 where they worked with executive Jerry Wexler and recorded “All Or Nothing.” The recording became a huge hit abroad. “We were the first black group to appear on British television. Vicki Wickham a British television producer heard us and liked what we were doing. She encouraged us to keep our performance date at the Apollo and brought individuals to the concert that resulted in new management for us. She had us play several New York venues which included Carnegie Hall. Epic Records signed us. When Labelle came out with “Lady Marmalade” it was a smash hit sending Labelle into orbit. After departing from Labelle, Patti and Nona went their separate ways where they found success. Dash was given a project to work with a famous writing team but did not have training as a solo artist since she had always been a background singer. “My demos did not work to well at first because I did not know how to be the lead voice. I had a lot of skills but there were some things I needed to learn. Don Kirshner took me under his wing and assigned the best songwriters to work with me. I rehearsed 5 days a week and learned different ways to approach a song. Credit goes to Don Kirshner and his songwriters who helped me find my own vocal voice. I needed a song to distinguish myself and was given “Sinner Man.” It was the first song in my solo album and it became a smash hit that found success all around the world. Sarah wanted to do something in memory of Aretha Franklin since their relationship goes back many years. She mentioned how the two met. “I am a preacher’s kid and so was Aretha. I met her many years ago when my father would take me around to sing at different churches. Aretha’s father also had Aretha sing at a few churches and I met her at one of them. We were shy but cordial to one another. Years later I was at the Plaza having high tea. 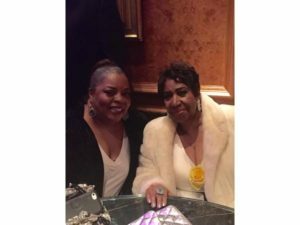 Aretha came in and we ended up chatting. She invited me to her birthday party. We started communicating and she invited me to several of her parties. We engaged in girl talk – emailing and texting one another. After Aretha passed, I thought about all of the work Aretha had done over the years. I always admired and respected her and knew her work well. I decided to honor Aretha. Not emulate her voice but honor her through the voice and spirit of my own soul by singing her songs in my upcoming concert. People who attend my tribute to Aretha will see how I felt about Aretha and what her work means to me,” remarked Sarah. Dash received a citation from the deputy Mayor of New York City due to her work with homeless women and children. Via her efforts, Sarah raised money which enabled her to acquire toys, clothing, shoes, books, food and pay for after school activities. She is involved with the Mercer Street Friends Food Bank and is also the spokesperson for a program that provides food for school children over the weekend called SHUP. She is a member on the Board of Governors of the Grammy’s and is also Trenton’s first Music and Arts ambassador. The community orientated Sarah, is a trustee for the newly formed NJ Philharmonic Orchestra where she sits on the board. She is planning on recording another CD, write her memoirs and is asking everyone to be more spiritually bonded to others. She also asked that readers pray for the health of her friend singer Candi Stanton. Dash encourages fans to support her upcoming Tribute show to Aretha Franklin on November 3 in Mt. Holly, NJ; in Washington, DC on November 5; and New York on November 6th.